A high percentage of purchasers appreciate the meaning behind this collaboration with Parley. More than getting a stylish sneaker, a great number of users relishes the recycling initiative behind this shoe, which makes it a more worthy purchase. A couple of users dubbed these as the best CS1 and Parley collaboration to date. Few users pointed out that these are the most comfortable shoes that they have every worn. Some reviewers find the design to be impressive and different. 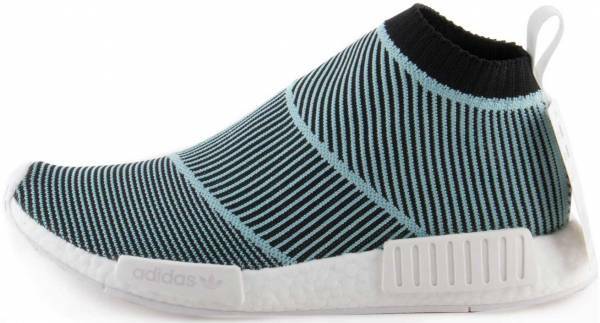 Based on the NMD_CS1 Parley Primeknit alone, one says that Adidas is on its A game. Many are pleased with their purchase. Numerous purchasers love the convenience of the slip-on wear and sock-like fit of these sneakers. The upper is composed of a breathable material. Much like the established reputation of the Ultra Boost, the Adidas NMD_CS1 Parley PK provides the same level of comfort. Many complained about the front area of the upper being a little loose. A couple of consumers recommend going a size up for that ideal fit. Being the instrument of change, Parley and Adidas show that their effort in raising awareness about the environment is far from happening. Made from recyclable materials, the NMD City Sock Parley Primeknit illustrates that our perception of good can still be made better. It was able to retain much of the qualities attributed to its OG-- comfortable, lightweight, and breathable, only made more stylish with its ocean-inspired colorway, which speaks highly of Parley. At $220, users can already avail of this fashionable and modern sneaker and support a cause. The year 2015 became a stellar year for the brand Adidas as its sales increased dramatically and its presence over the athleisure trend and sneakerheads became prevalent. With the release of the Ultra Boost, the sneaker that is regarded as the greatest running shoe of all-time, series of collaborations, and unique concept stores, the brand has ended the year much stronger than ever. To sustain the heat of the year, Adidas released the NMD, a line of sneakers that has the everyday living in mind but carrying the brand's premier technologies. For a futuristic shoe, it can be quite ironic that its designers, spearheaded by Nic Galway, referred to the archives and took the Boston Super, Rising Star, and Micropacer as inspiration for the NMD. In 2016, the brand followed up the released of the NMD_C1. Soon after, despite being the new kid on the block, it has been reinvented into different silhouettes and interpreted in various ways through collaborations. One of the most notable collaborations is with Parley for the Oceans, an organization that addresses the oceans' significant threats. After a successful partnership with Adidas in 2017, reportedly sold one million pairs, there is no stopping the brand from producing another collection and continuing its advocacy on raising awareness about the environment. With the rising awareness of the severity of the problem of the oceans, it is just that this collaboration pushes through. This collaboration delves much inspiration from the marine ecosystem as the upper of the shoe sports an ocean-themed blue colorway with black striping accents. The bottom part is kept minimal with a crisp and clean white recycled rubber outsole and white NMD Boost tooling. Much like the ultimate concept of the NMD, it remains to be a recognizable sneaker even without the Three Stripes. Most of the users who styled these paired it with trousers and tapered jeans to make it stand out. Getting the NMD_CS1 Primeknit's mid-top silhouette, the Parley version also offers the same lace-less and sock-like fit. The elastic band at the top secures the feet in place. More so, the pull tab allows a secure slip-on feel. Offered in men's sizes, users can choose from a wide range of sizes from 4-14. All of these have half sizes except for 13-14. Women wanting to get the same style can also do so, only keeping in mind to go 1.5 sizes down for that ideal fit. We already know the wonders of the NMD City Sock. However, the features of the Parley Primeknit collaboration are taken a level higher. Known to be the purveyor of the environment, each material used on the shoe does not only minimize environmental impact but, in fact, are even of help. The knitted textile has long been the quest for major athletic footwear brands. With Adidas coming with their Primeknit technology and with this partnership, the upper of the shoe utilizes the Parley Ocean Plastic yarns, a material made of recycled waste from the beach and coastal communities. The PK doesn't sacrifice the breathability and comfort known to the original. The NMD City Sock Parley Primeknit sports the signature Boost midsole, Adidas' most responsive cushioning system. This collection was globally released on March 31, 2018.